Samuel H. Smith was selected by the Board of Regents on March 7, 1985, to serve as the institution’s 8th president. He took office at age 45 on July 1, 1985, and served for 15 years. A hallmark of the Smith administration was the establishment in 1989 of WSU campuses in Spokane, the Tri-Cities, and Vancouver to serve place-bound and job-bound students. Learning centers and award-winning Extended Degree Programs, now called the Global Campus, further expanded access to the University. 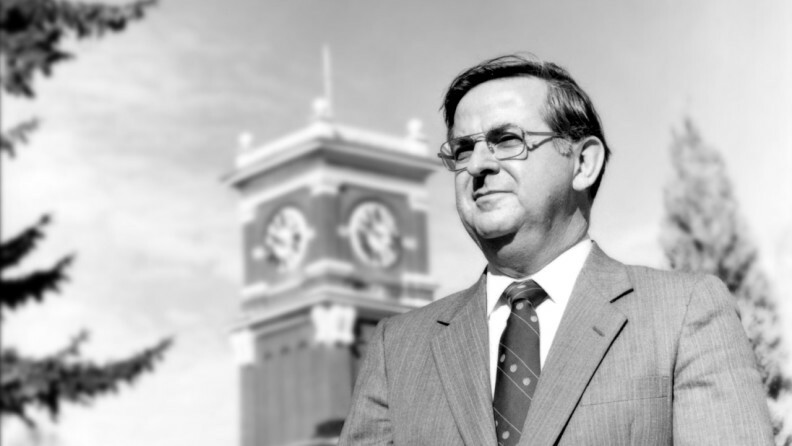 More than one-third of all of WSU’s graduates received their degrees during the period of 1985-2000 when Smith was president. Smith earned 2 plant pathology degrees from the University of California at Berkeley, a bachelor’s in 1961 and a Ph.D. in 1964. He was a NATO postdoctoral fellow at the Glasshouse Crops Research Institute in England in 1964-1965. He has received 4 honorary doctoral degrees, from Nihon University in Tokyo, Far Eastern State University in Vladivostok, Western Governors University in Salt Lake City, and City University in Seattle. Born Feb. 4, 1940, in Salinas, California, Smith came to WSU after serving 16 years at Pennsylvania State University, initially as a faculty member, then department head, and finally, dean of the College of Agriculture and director of both the Cooperative Extension Service and Agricultural Experiment Station. Prior to Penn State, he was a member of the faculty at the University of California Berkeley. Under Smith’s leadership, WSU grew in size and stature. Its teaching, research, and public service activities received worldwide recognition. Strengthening undergraduate and graduate education, placing an international imprint on programs, and increasing opportunities for women and minorities were among his priorities. Smith led Campaign WSU, the University’s first comprehensive fund-raising effort that raised $275.4 million in private support, substantially more than its $250 million goal. The campaign transformed the University’s ability to serve students and the state of Washington by supporting scholarships, faculty recruitment and retention, learning technology and statewide education. From 1997-99, Smith served as chair of the executive committee of the National Collegiate Athletic Association, one of a series of leadership positions he held during a major reorganization of NCAA governance. In 2000, Smith chaired the Board of Directors of the National Association of State Universities and Land-Grant Colleges, the nation’s oldest higher education association. He also served on NASULGC’s Kellogg Commission on the Future of the State and Land-Grant Universities. The commission planned for change and improvement of state universities and land-grant colleges for the 21st century. Smith concluded his presidency on June 8, 2000. As president emeritus, he established an office at WSU West in Seattle, where he and his wife, Patricia, live. The Smiths continue to support the WSU Museum of Art. They have attracted world-class artwork for display in the Samuel H. Smith Center for Undergraduate Education, named for Smith in 2002, the year the building opened on the Pullman campus. After leaving the presidency, Smith continued as a trustee of the Western Governors University; a founding director of the Talaris Research Institute; a founding director of the College Success Foundation, which now extends nationwide; and founding director of the Behind the Badge Foundation. He serves on several boards within the art community. He has received the Weldon B. Gibson Distinguished Volunteer Award, the WSU Foundation’s highest honor. Established a WSU office in downtown Seattle, served for 9 years on the state of Washington’s Higher Education Coordinating Board, and is a founding director of the College Success Foundation, which provides scholarships to low-income, high-potential students.